James Longman and Mark Cousins look through photos together. I’ve never felt like I had much family. I’m an only child and my father died when I was small, so it's often felt like it's just been my mum and me. But her parents did feature pretty strongly in my early life. They lived with us when I was growing up and I knew a little of their history, although as a teenager I was too young and immature to ask the questions I now know I should have. I didn’t expect an encounter on Meghan and Harry’s royal tour around the South Pacific would answer so many of them. About a year ago, I posted the story of how they met to my Facebook page - and it’s a pretty good one. My grandmother, Gabriella Sawaya, was a Lebanese woman living in Cairo in the early 1940s. 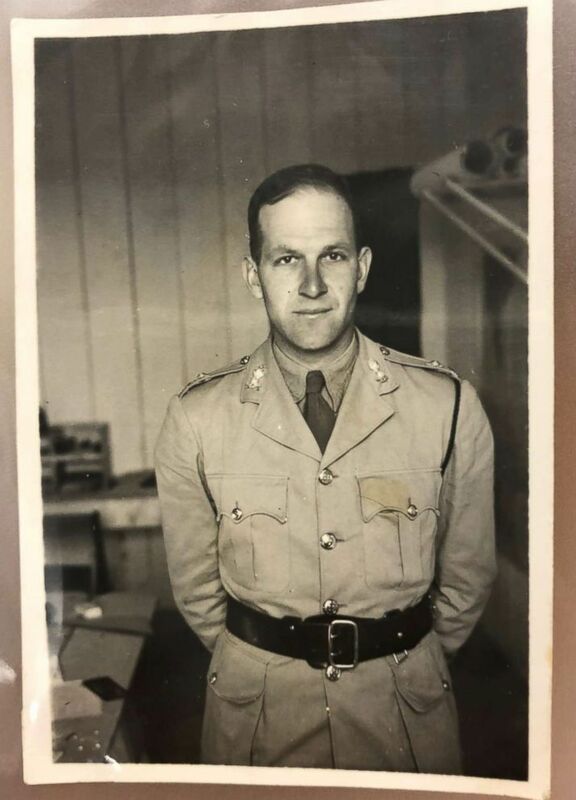 At the wedding of the King of Egypt, she met a Kiwi officer - Harold Claridge - who was posted to North Africa to fight with the ANZACS (The Australian and New Zealand Army Corp). 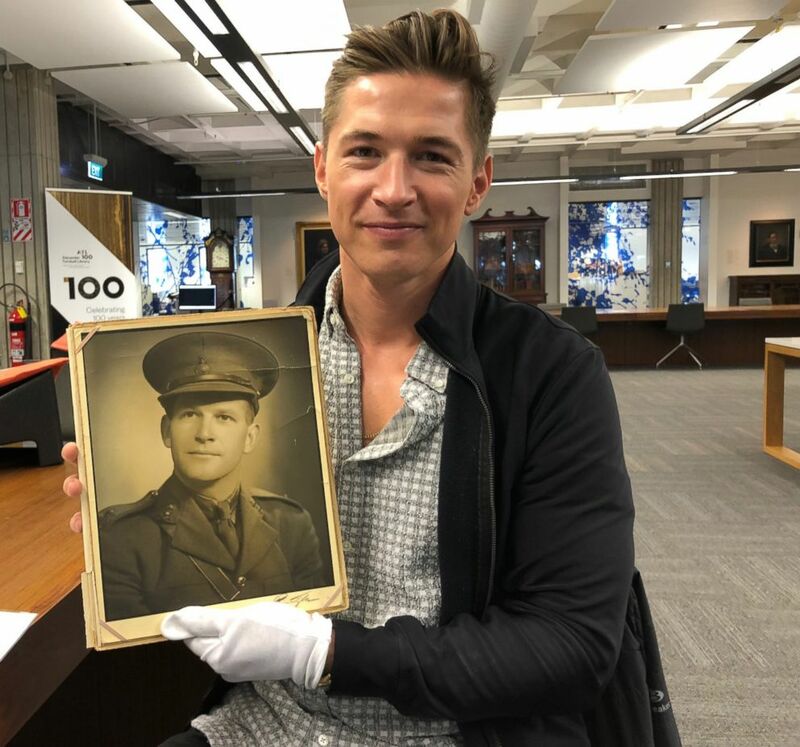 James Longman holding a photo of his grandfather's photo. These were apparently the kinds of parties she was invited to (!) and he was there as a courtesy to his Egyptian hosts to represent his regiment. They met and, so the story goes, they sat on a palace balcony staring at each other. As was typical then, she spoke many languages - Arabic, French, Italian and Greek. Unfortunately he could not understand any of them. So after spending the evening giggling at their misunderstandings, overseen by her elder sister as chaperone, she gave him her address in Cairo. James Longman's grandmother Gabriella Sawaya on the beach in Alexandria, Egypt, 1940. He was sent to Alamein in northern Egypt soon after - where some of the most important battles in the war were raging - and while he was away she learned English for him. He would come back to Cairo on leave from the front and over the next few years they courted. They were married at the end of the war and in 1945 had my mother. 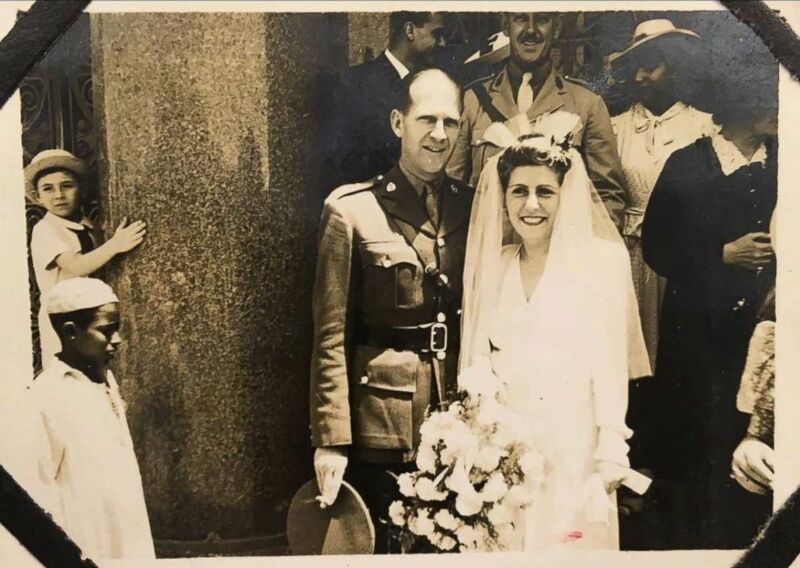 Gabriella Sawaya and Harold Claridge on their wedding day in 1944. They were married at the Helipolis Basilica in Cairo. 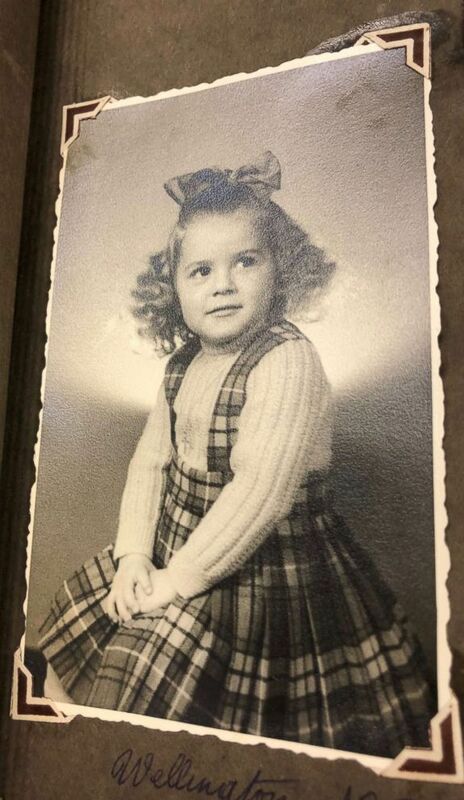 James Longman's mother, Ann Longman, photographed when she was about 6 during a family holiday in Wellington, New Zealand. After being decommissioned, he returned to his work as an architect and brought his family to Libya, Iraq -- where he was involved in building the palace in Baghdad -- and then finally to Lebanon. But with war or revolution in each place, they kept moving, essentially becoming refugees many times over. With his New Zealand passport and war record, my grandfather was eventually able to relocate the family to England in the 1970s, where they lived until they were 96 years old. They died when I was in my mid-teens within a couple of years of one another. In 2017, I was in Egypt and visited Helipolis Basilica in Cairo where they were married. Fast forward a year, to a dark patch of earth in an Indonesian hotel courtyard. I was dozing in the heat in Palu, on assignment to cover the earthquake and tsunami, when my phone buzzed. Someone had commented on my Facebook post with a photograph of Harold and Gabriella on their wedding day and the question: James, are these your grandparents? Struggling to find enough service to reply, I eventually started exchanging emails with this person, initially thinking he was family. But it turned out even better - the man’s name was Mark Cousins and he was writing from Wellington. His grandfather Clarence had been my grandfather’s military orderly - or batman - during the war. He died fighting but during his service had written letters home in which he’d described in glowing terms a "Mr. Claridge," whom he greatly respected. So Mark began to investigate. He took his search to the New Zealand national library and sure enough, found my grandfather’s details. But more than that, he’d found all his personal photo albums. A month later I was in Wellington at the end of Meghan and Harry’s royal tour. I had work to do but I HAD to meet Mark and visit the library with him. So we did and what I found was extraordinary. 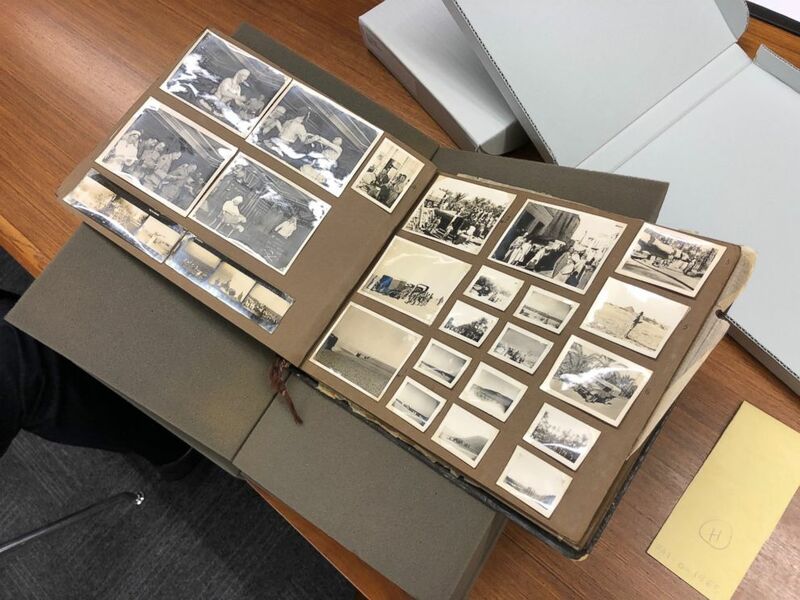 Photos of my grandfather at training camps in New Zealand before the war; on the SS Strathaird that took them via Sri Lanka and Cape Town to the Egyptian front; out in the desert with his men; my grandparents as a young couple; time spent at the beach in Tripoli; at the races in Egypt; in the mountains of Lebanon; my mum as a baby, as a teen and then as a young adult. Mark told me some of the photos had writing on the back but one photo had a particular impact. 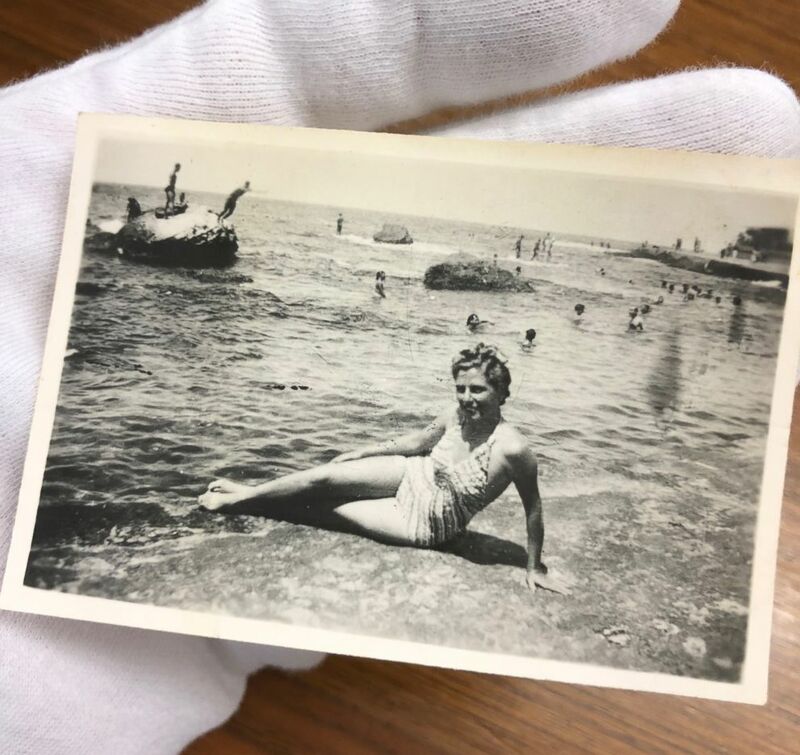 I randomly chose one of my grandmother looking very glamorous on the beach in Alexandria. I turned it around and sure enough there was writing. In her impeccable script, one short line in pencil: "Don’t forget me." 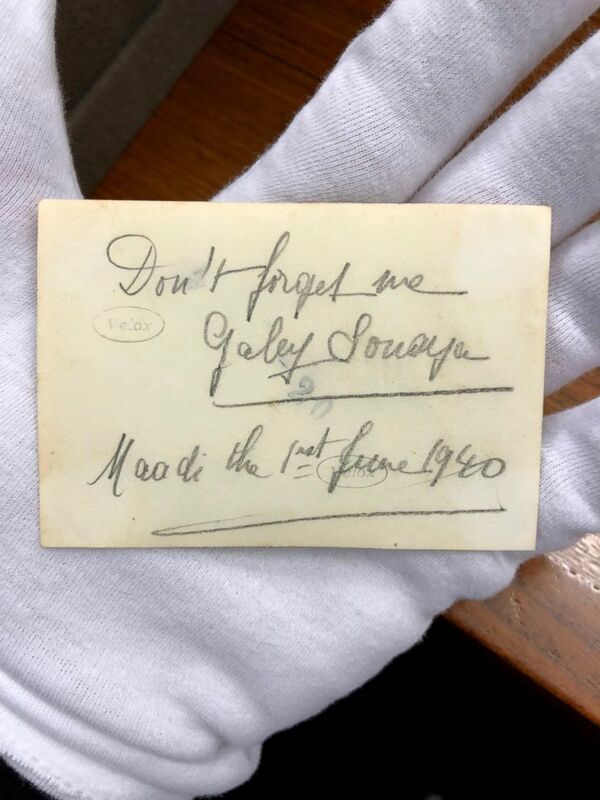 The message Gabriella Sawaya, James Longman's grandmother, wrote on the back for his grandfather, Harold Claridge. I dropped the card and started to cry. She gave this photo as a memento to my grandfather as he went to war. It would have sat in his pocket or in his pitched tent, as they were in the sand dunes of northern Egypt. It would have traveled with him through war and revolution and through time: my mother’s birth and then mine. It was a piece of history and the beginning of their love story and here I was, holding it in my hands nearly 80 years after it was written. Mark and I sat and chatted, surrounded by the story of my family with tears in our eyes. What would they have made of it, we wondered? Our two grandfathers had fought alongside each other thousands of miles away and now here we were, a generation later, back in the home which Clarence at least never saw again. Mark is an extraordinary human being: with a sense of duty you rarely see, he has been piecing together the histories of all the men in my grandfather’s company. And one of them still lives - Dennis. He’s 100 now, back in New Zealand, and Mark tells me he’s going to take the photo of us together, in order to show him this history coming full circle. We still have no idea how the albums made it back to New Zealand or who put them in the library. In 1994, Mark did manage briefly to track down my grandfather. He wrote to him to ask for any memories he had of Clarence, and sure enough, he responded. Mark photocopied the letter and I’m now sitting on my flight home with my first chance to read it, again moved to tears. Harold Claridge in his office in Maadi, Egypt, during the war. He describes Clarence - or "Clarry," in his typically no nonsense way, as "an excellent man, well mannered, steady, reliable and quick to learn." My mum says the death of perhaps the person closest to him in the war affected my grandfather for the rest of his life. For me, the photos of his time at war have brought into sharp relief the experiences of a whole generation - experiences which are entirely impossible to understand now. The huge personal loss and sacrifice; the danger; the young age of so many of those men. In one photo, my grandfather captures a bare-chested soldier crouched in the empty expanse of desert, carefully extracting what looks like a small metal tin from the ground - one of the thousands of German mines his unit was tasked with clearing. A speck behind him in the distance is the next man in the line doing the same thing. So many died doing this. In another, we see lines of troops sitting with their legs dangling over the side of the ship that took them to war, laughing as they catch oranges being thrown up by Sri Lankan farmers on wobbly little wooden rafts. Oblivious, perhaps, to the challenges ahead of them. How many of these men never came back? How many of them did my grandfather have to watch die? 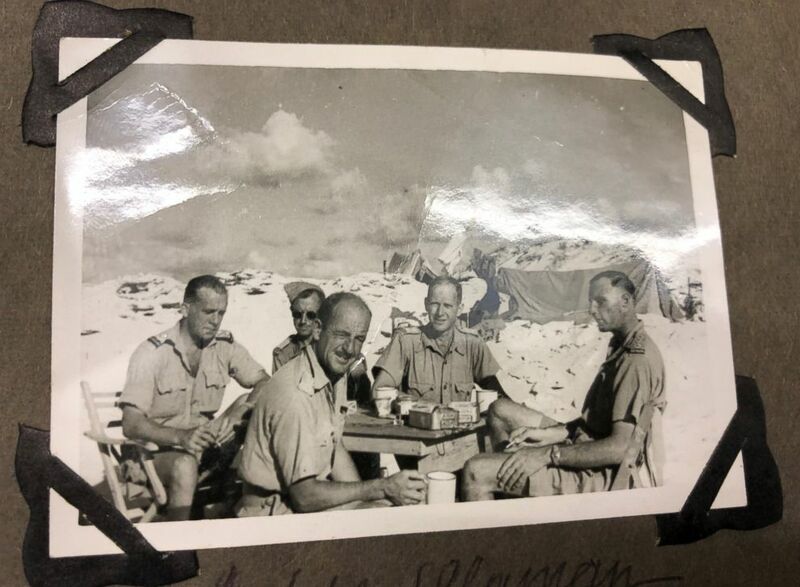 Harold Claridge surrounded by other officers in the desert at Alamein, Egypt.